Security eyelets at the front enable you to lock the cover to your bike via the front wheel (max lock diameter is 28 mm, not included). The XL-XW size hardly covers two bikes. The Goose cover is a premium product that offers a reliable protection for your bike or scooter from the elements. It is very convenient to use, as it is equipped with elastic rims, chain eyelets and small reflective loops. It's made of high-quality thick fabric that will endure all seasons. The cover is completely black and hard to stain. Thanks to the reflective loops, the cover will be well-visible in the dark. It's a bit on the stiff side. This black cover is ideal for travel use. 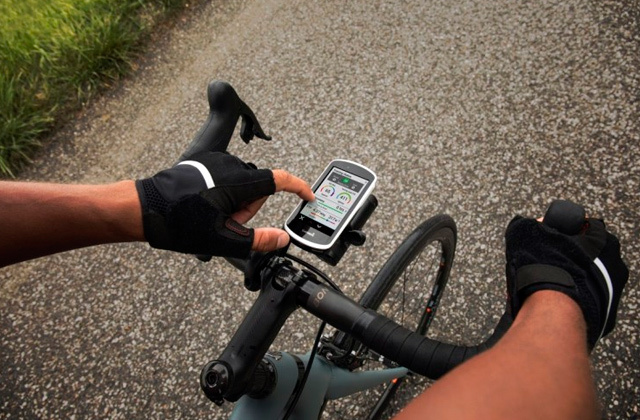 It's light, portable, and is suitable for most sports and mountain bikes. It's offered in an Extra Large size and can easily fit a small scooter or two bicycles. Ideal for couples who live a very active lifestyle. The hems at the bottom are super-strong, thus, the cover will stay secure even on extremely windy days. Plus, there is a helpful buckle at the bottom for extra protection. The white side of the cover might easily get dirty. It's a very reasonably-priced cover in black-and-white design. It's offered in XL size and can fit not only bikes (including E-bikes) but also scooters and certain motorbikes. It is lightweight and comes with a convenient draw-string carry bag. Just pack it and go! Reliable straps with a strong clasp system will hold the bottom of the cover tightly around your bike. It doesn't cover two bikes completely up to the floor. Designed for all weather conditions, this cover will reliably protect your bike from the elements. 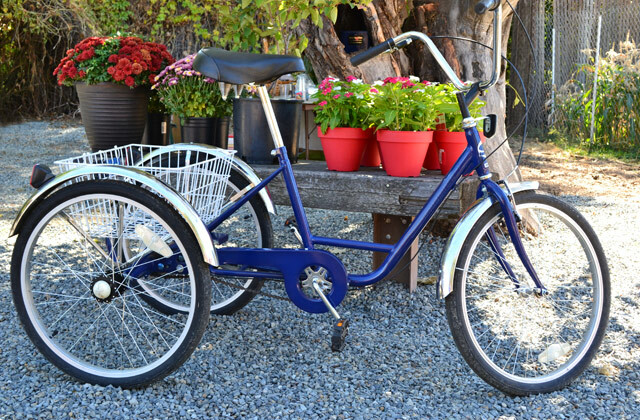 It fully covers one adults' bike, scooter or two foldable, BMX, or children's bikes. It looks nice and is easy to clean. An excellent gift for every cyclist. The cover has a silver thermal protective coating inside that ensures excellent protection from harmful UV-rays. The 210T Taffeta fabric is thinner than nylon or Oxford fabric. This tear-resistant, anti-wind, waterproof, anti-UV cover is suitable for year-round use. Although the manufacturer claims that it can fit two bikes, we recommend you to use it for one bike or scooter only. Choose the Best for Your Bike! 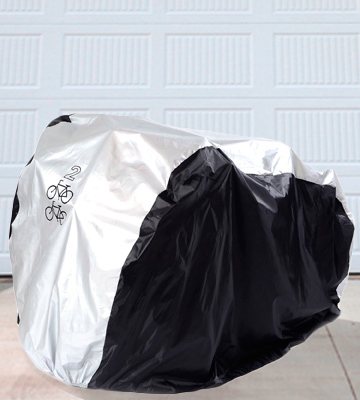 If you want to keep your bike clean and dry throughout all seasons, choose the bike cover from Goose. It can protect your two-wheeler from dirt, dust, UV, rain, and snow, thereby prolonging its service life. Made of tough double-stitched Oxford 210D fabric, it looks super tough and can stand up to the worst of the British weather. Owing to sealed seams, it will keep your precious bike dry through many rainy nights, even if it rains hard. The elasticated bottom will snugly hug the wheels, ensuring a correct fit. Plus, there are additional fixing straps to hold the cover in place in the very high wind. 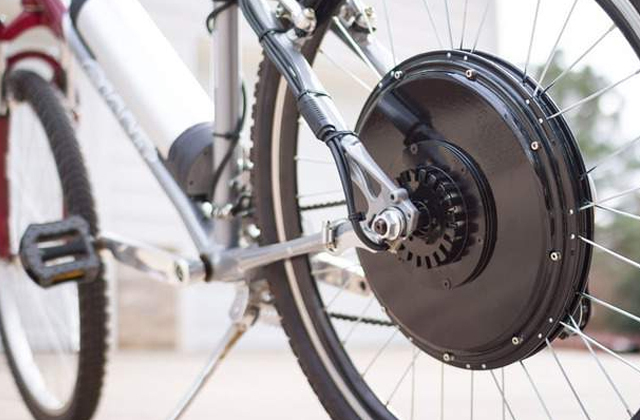 To protect your bike from potential theft or vandalism, the manufacturer has equipped the cover with security chain eyelets (max lock diameter is 28 mm). The cover comes in a quality drawstring pouch, however, squeezing it back in the pouch isn't easy. The cover is available only in Black or Dark Blue colours. 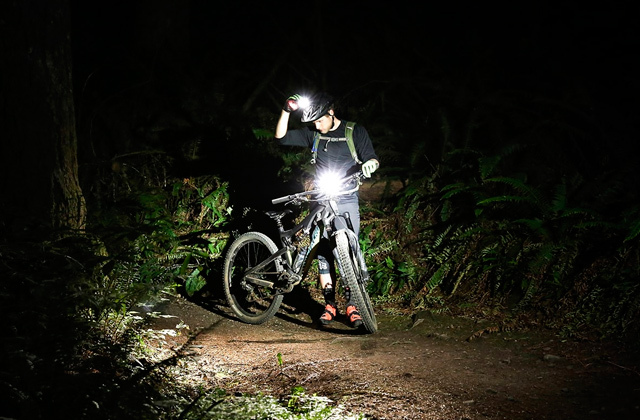 Both options have small reflective loops that are very helpful, as they enable you to quickly find your bike in the evening. The cover comes in a wide range of sizes to fit nearly all bikes (Small, Medium, Large, Extra Large and Extra Large-Extra Wide). So whatever bike you have, you can choose the right size that will perfectly suit your vehicle. For example, a smaller option is perfect for road bikes, while a large cover is designed for mountain bikes with up to 29" wheels. 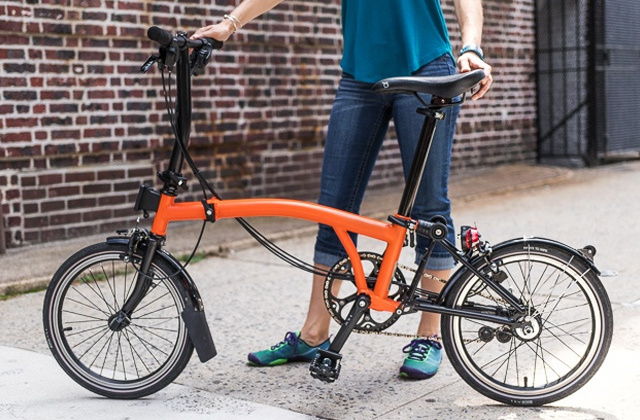 And the best part is that you can choose an Extra Large-Extra Wide option which will cover two adult bikes. 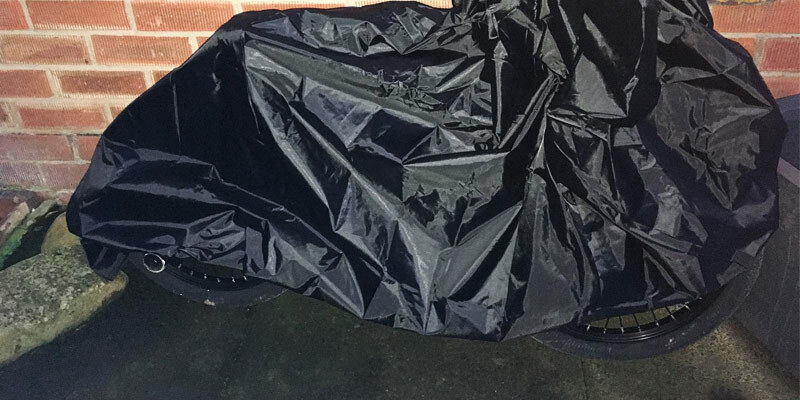 It's really the best all-weather bike cover so far! 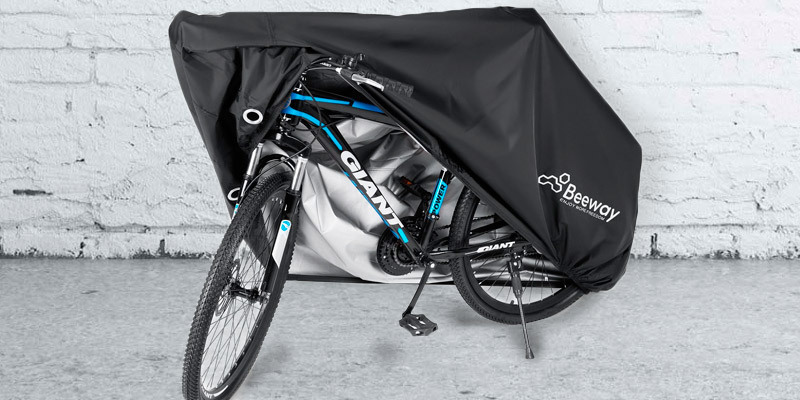 If your partner enjoys cycling as much as you do, the Beeway® 190T bicycle cover is definitely worth your attention. Designed for all-weather protection, it can shield your two bicycles from the sun, wind, snow, rain and prevent them from scratching and fading. What makes it so special? The durable high-quality materials used by the manufacturer: 190T Nylon material with PU coating. Also, the cover is equipped with ergonomic front, middle, back elasticized hems and a storm strap to prevent blowing off on windy days. One end of the base, the cover has a pair of holes so that you can slip a secure lock bar through the front wheel (lock is not included). Lock holes can not only prevent theft but also add extra safety in stormy weather. The cover doesn't look baggy and the Nylon material feels very sturdy. Being 200 cm x 100 cm x 80 cm in overall dimensions, it covers 2 decent-sized bikes and keeps them completely dry. 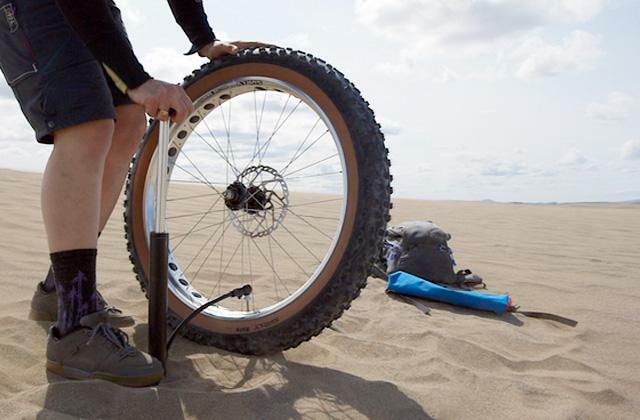 It's suitable for 2 mountain bikes up to 26" wheel size and 2 city bikes up to 29" wheel size. Additionally, it's supplied with a lightweight drawstring pouch for convenient storage and transportation. The cover is easy to fold/unfold and carry around. So, it's a good option to always have at hand. Whether you crash at your friends' house or want to shield your bicycles from sunlight exposure during a picnic, the Beeway cover will come in handy. The Zacro ZBC4-AUX-UK-1 is a versatile protective cover that will suit not only any type of bike with up to 29" wheel size but also scooters and certain motorbikes. It's offered in XL size (200 cm x 70 cm x 110 cm) and can offer excellent protection to most two-wheelers. Still, we recommend you to measure your vehicle before purchase. And no matter whether you are going to store it indoors or outdoors, the cover will shield it from various external impacts. It will assist in preventing corrosion and ensure proper wind, rain, sun, mud, and dust protection. This black-and-white waterproof bike cover looks smart and stylish. It's made of high-quality materials - 190T nylon and PU coating. The material is 40+ UV resistant and can easily repel water. And the double-stitched hems along with heat-seamed sealing technology ensure that no water will leak through the sewing. Thanks to elastic bottom hems, the cover is easy to put over your bike and fix. 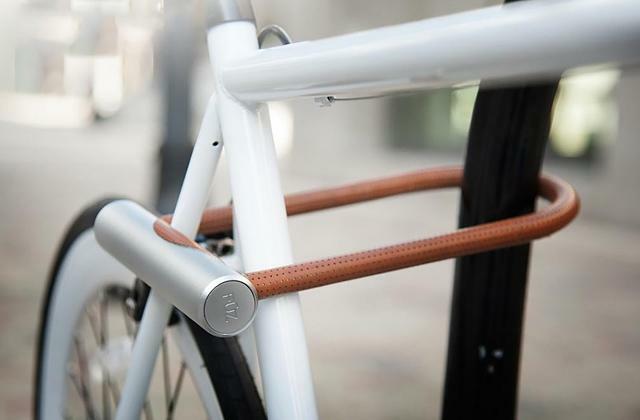 In addition, it features a buckle at the bottom which will stabilize the cover on top of your bike, keeping it secure on very windy days. The Zacro bicycle cover is easy to pack up small and carry around in an ergonomic draw-string bag (included in the set). 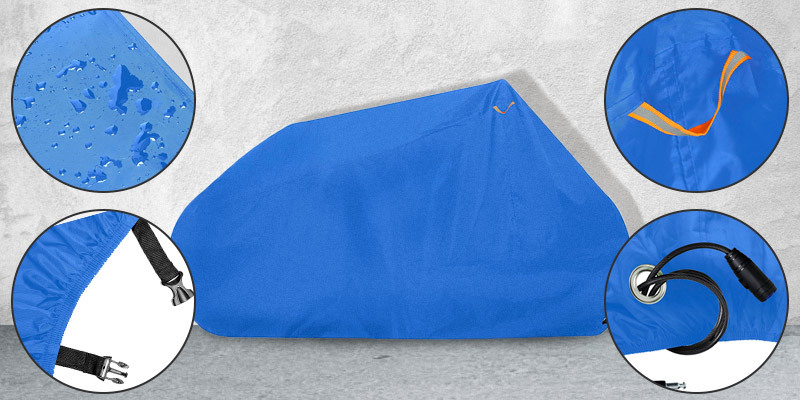 So, pack this folding bike cover and take it wherever you go! 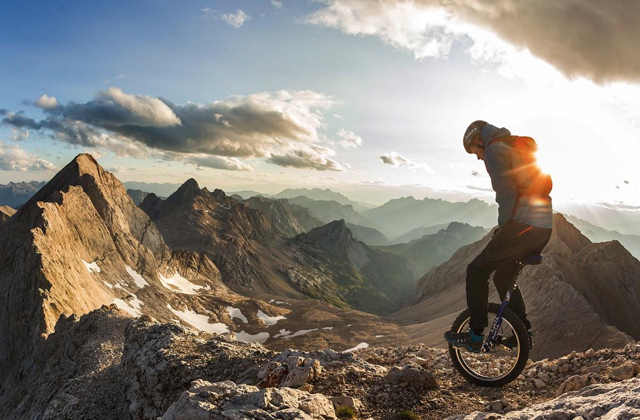 If you have a few bikes for different purposes, for example, a mountain bike and a city bike, you need to have them both protected. The Maveek Cycle Waterproof Cover can do the trick. At 200 cm x 75 cm x 110 cm, it can fit for various bikes with up to 29" wheel size. Plus, it can cover not only adults' bikes but children's tricycles and pedal karts. It's a great quality cover to keep any bike well-protected. 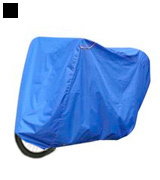 This complete bike cover is manufactured from high-density 190T nylon material and has PU coating. The material is very durable, light and easy to clean. 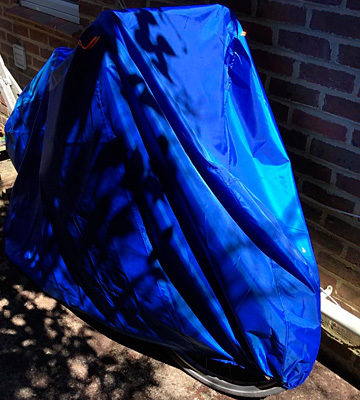 This bicycle cover for 2 bikes features an elasticated band at the bottom to provide a snug fit and all-around protection. The clasp system holds the bottom tightly. For extra security, the cover is equipped with an adjustable strap that easily passes under two frames and can be fastened with a strong snap-lock. The item comes in a nice storage pouch which can be used for storing other things as well. But the best part is that this waterproof and dustproof bicycle cover is available at a very attractive price. So if you need an affordable cover to protect your bikes in this awful weather, get this! 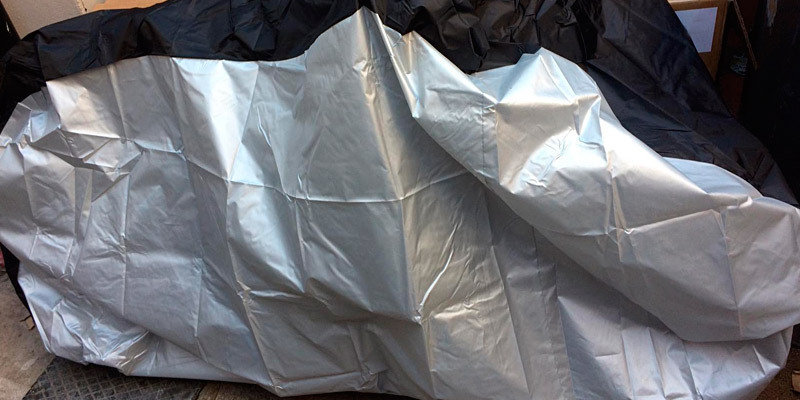 The Awnic outdoor bike cover is a tear-resistant, anti-wind, waterproof, and anti-UV model. It can reliably protect your two-wheeler from dirt, dust, scratches, rain, snow, tree sap, and birds' droppings. The cover features a silver thermal protective coating inside, which makes it extremely resistant to harmful UV rays. 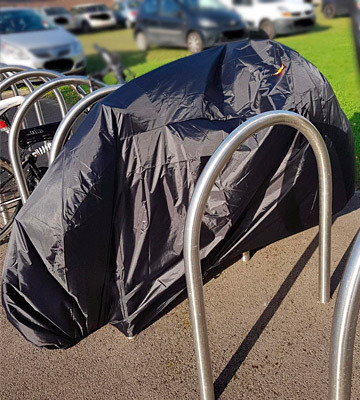 So, in the sunny weather, the cover will protect your bike from overheating and fading. Yet the main material the cover is made of is 210T taffeta. This fabric is a little thinner than rough Oxford fabric, but it's more compact and more durable. Thanks to its high density and waterproof properties, it perfectly repels moisture. At 200 cm x 70 cm x 110 cm, the cover is suitable for most 29" bikes. It is very easy to put over the bike thanks to its elastic bottom. It's very lightweight and fits the bike like a glove. For the windy weather, it's equipped with a useful clip at the base. The cover folds up very easily to go back into the storage bag which also comes in the package. Once folded up, it's very small and compact enough to pop in a carry basket on the front of your bike, of course, if you have one. 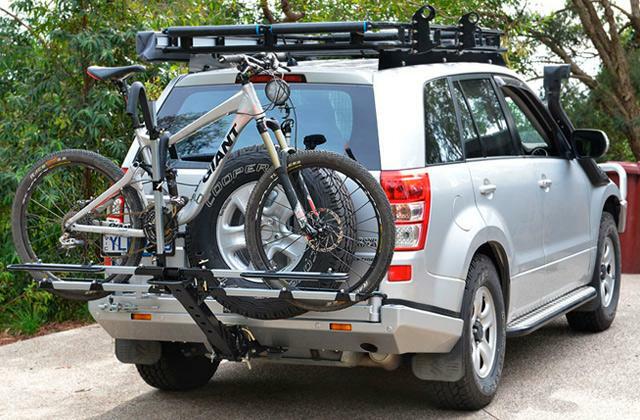 If you need an extra -compact bike carrier cover, this model is the best option. What Is a Bike Cover? 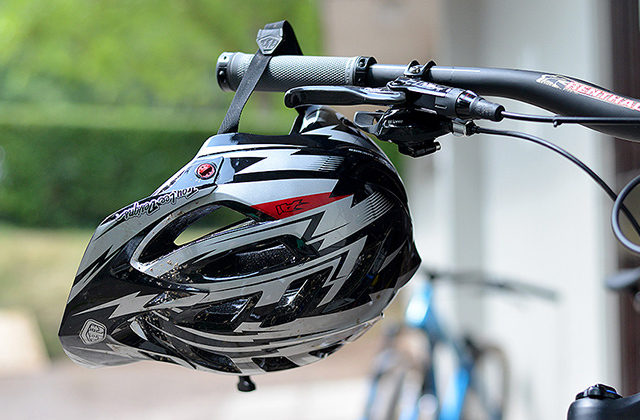 What makes a bike cover an irreplaceable accessory for any cyclist? If left outside without a cover, your bicycle will rapidly undergo corrosion and rust. That's why a quality bike cover is essential. This useful invention ensures a reliable weather protection. In other words, your two-wheeled friend won't be damaged by the sun, rain, snow, dirt, tree sap, birds' bombs, and dust. Plus, a bicycle cover can be used for comfortable indoor storage during winters and for convenient transportation. That's why we have selected only the top protective covers for both indoor and outdoor use in this review. Keep reading and choose the best one for your bike. For the comfortable transportation of your bike by car, consider buying one of these wonderful bike racks. 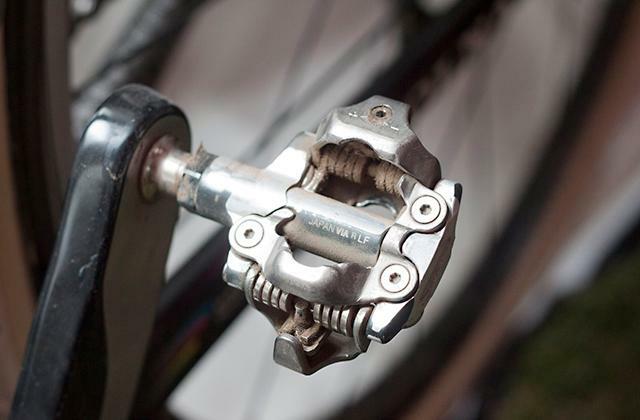 If you are interested in bicycle parts, we recommend you to look through our mountain bike pedals review. When choosing a bicycle cover, you should consider its use and type. The first relates to the number of bicycles you are going to shield. 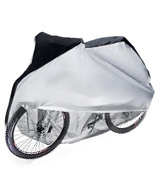 Waterproof outdoor bicycle covers are designed for weather protection, while indoor or dust covers will prevent your two-wheeler from being scratched and damaged if stored in your house, garage, or shed. 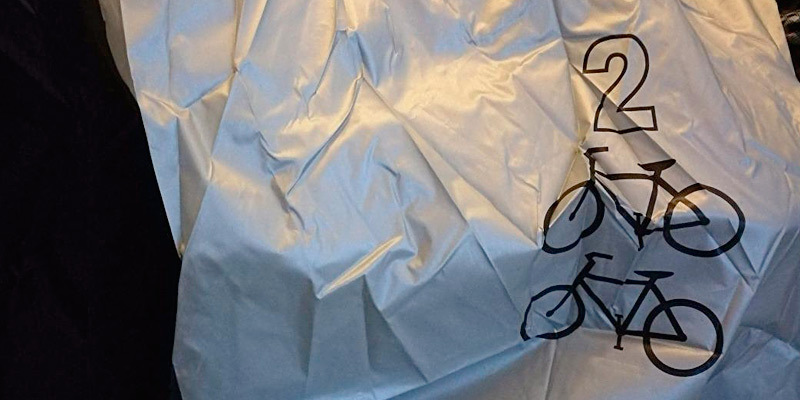 There are three main types of bike covers. 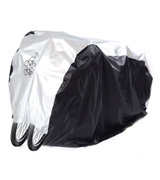 The first one, a full bike cover, ensures a reliable protection of your bicycle during outdoor/indoor storage. Next, a vehicle bike cover will protect your two-wheeler when transported. The last one, a waterproof seat cover, will shield your bike saddle from the elements and keep it dry. When it comes to transportation, a bike case may also come in handy: there are hard and soft models to choose from. Besides, they can be used for indoor storage as well. Purchasing a bike cover, you should also decide what your two-wheeler needs to be protected from. An outdoor bicycle cover will keep your vehicle protected from rain, snow, dust, and harmful UV rays. 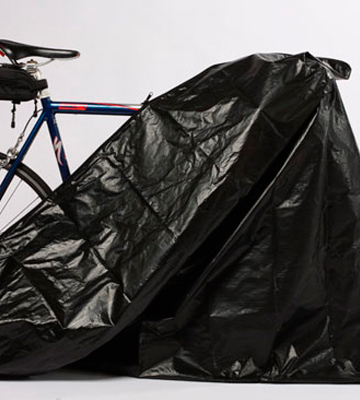 On the other hand, an indoor bike cover will protect your bike from dust and scratches. Without any doubt, bike cover efficiency depends on the materials quality and density. That is why bicycle covers are usually made of durable synthetic materials that won't scratch or damage your two-wheeled friend. At the same time, they provide an effective protection from the external factors. 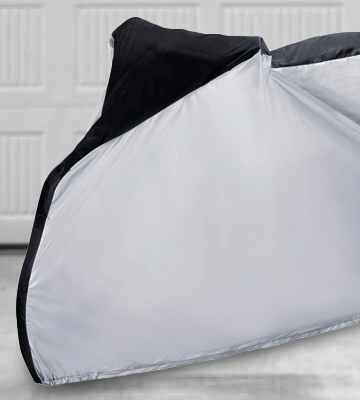 One of the most important things to consider while selecting a bike cover is its convenience. It is advisable to choose the item that is easy to fix thanks to drawstrings, a middle buckle, or eyelets for locking a bike! Elasticized front and back hems will also help protect your bike in case of strong wind. Air vents will help eliminate condensation to prevent corrosion and rust. In such a way, a thoughtful design and useful extras will grant the most reliable protection of your vehicle. 1. 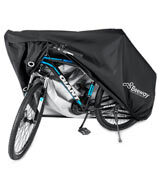 Bike Covers buying guide, Chain Reaction Cycles. 2. Bike Storage: How to Choose, REI. July 28, 2016. 3. Motorbike Cover Buying Guide, eBay. 4. Caitlin Giddings What Happens When You Leave Your Bike Outside, Bicycling. January 21, 2016. 5. Diana Smith How to Protect Your Bicycle from Rust, eHow. 6. Diana Gerstacker How to Protect Your Bike from Winter Weather, The Active Times. January 22, 2015. 7. Cycling, Wikipedia. October 22, 2016. 8. Mountain bicycle, Encyclopaedia Britannica. 9. 29er (bicycle), Wikipedia. June 20, 2016. 10. 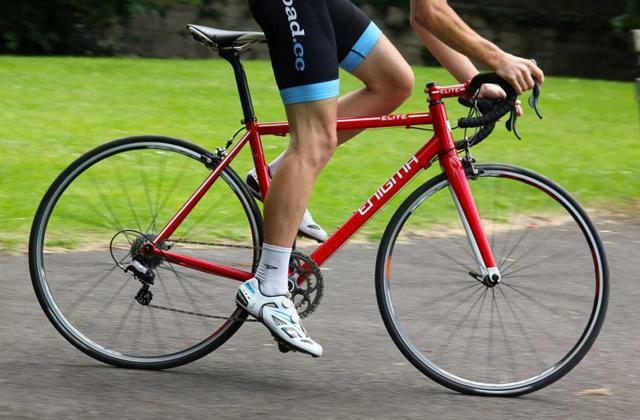 What is the Difference Between a Mountain Bike and a Road Bike? wiseGEEK.